1. Melt the butter in a large saucepan over a low-medium heat and add the onion, garlic and thyme. Cook for 1 hour, stirring occasionally until caramelised and dark. If the onions start to catch on the pan, add a little water and stir more frequently. 2. Meanwhile, coat the bottom of a frying pan with a thin layer of oil and place over a medium heat. Add the bacon and cook for 5–8 minutes until the bacon is soft and starts to colour. Drain on kitchen paper and set aside. Deglaze the pan of onions with the Madeira, and cook for 5 minutes. Add the bacon and season with salt and freshly ground pepper. Allow to cool. Can be kept in the fridge for up to a week. 3. 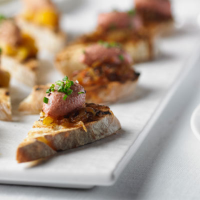 Serve on a slice of slightly charred crusty bread with a little of the compote.Top with thinly sliced chives, salt and freshly ground black pepper. This recipe was first published in December 2013.